"Find myself & World Peace"
My Philosophy We will overcome this hate, poverty, division, and racial tension between us. "WE GONE BE ALRIGHT"
What Gives Me Hope Seeing another person happy. This world can be a cold and dark place. Just to see someone happy whether its a baby or a old person... it makes me happy and gives me hope. Thats telling me no matter the problem big or small, I can get pass this problem and be happy. If I were Mayor, I'd make the world a better place by End the useless wars. 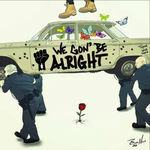 Quotation "we gon' be alright" "you ain't gone never be happy until you love yourz"